1 lb dipping chocolate or 1 lb confectioner’s coating . Stir together powdered sugar, peanut butter and butter until well mixed. 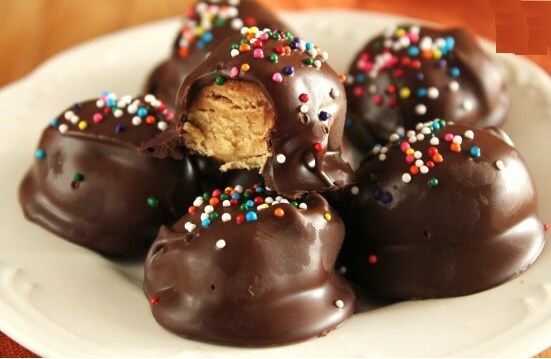 Shape peanut butter mixture into 1 inch balls, placing them on a baking sheet covered with waxed paper. Let balls stand for 20 minutes until dry. Melt the dipping chocolate or confectioners’ coating. Drop balls one at a time in melted chocolate. Using a fork, remove from the chocolate, letting excess chocolate drip off. Place back on the waxed paper. Store tightly covered in a cool dry place.